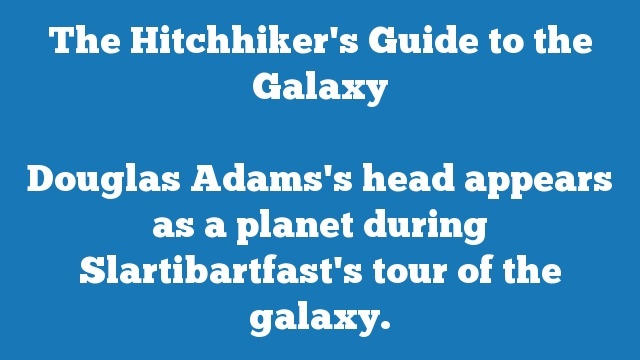 Douglas Adams’s head appears as a planet during Slartibartfast’s tour of the galaxy. 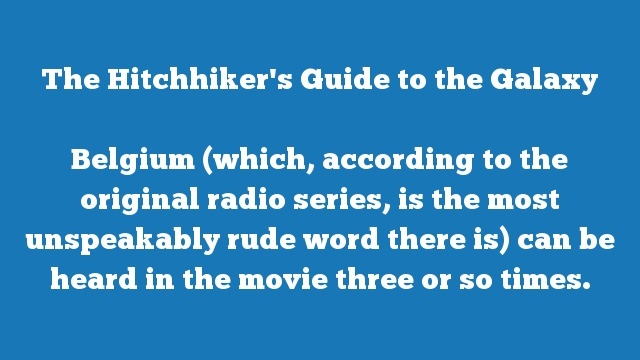 Belgium (which, according to the original radio series, is the most unspeakably rude word there is) can be heard in the movie three or so times. 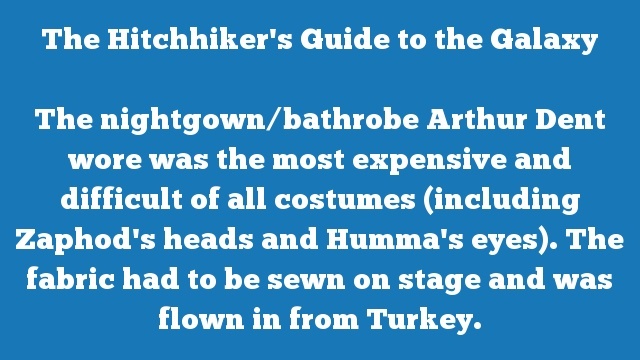 The nightgown/bathrobe Arthur Dent wore was the most expensive and difficult of all costumes (including Zaphod’s heads and Humma’s eyes). The fabric had to be sewn on stage and was flown in from Turkey. 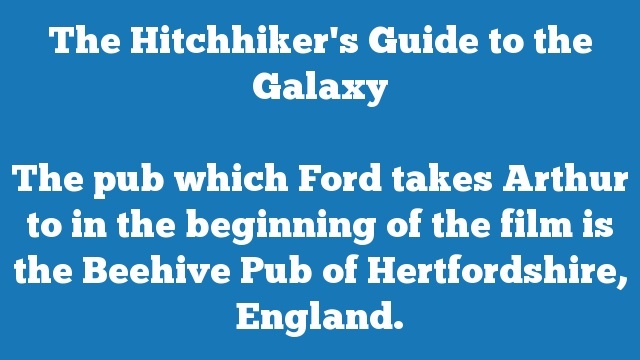 The pub which Ford takes Arthur to in the beginning of the film is the Beehive Pub of Hertfordshire, England. 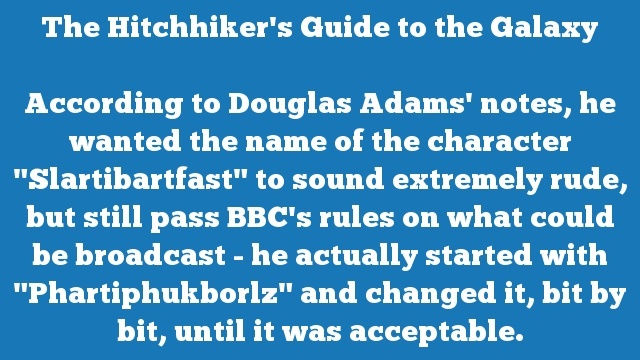 According to Douglas Adams’ notes, he wanted the name of the character “Slartibartfast” to sound extremely rude, but still pass BBC’s rules on what could be broadcast – he actually started with “Phartiphukborlz” and changed it, bit by bit, until it was acceptable. Faint screams can be heard a moment before Mr. Prosser speaks. 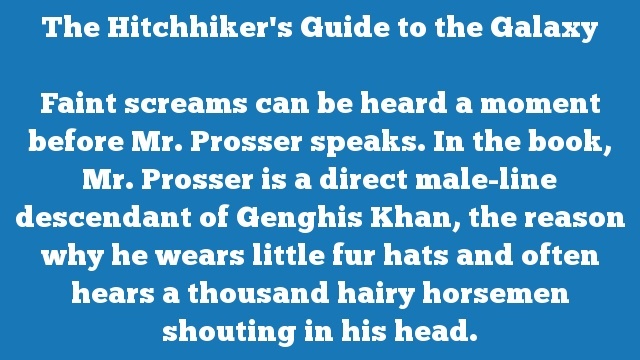 In the book, Mr. Prosser is a direct male-line descendant of Genghis Khan, the reason why he wears little fur hats and often hears a thousand hairy horsemen shouting in his head. 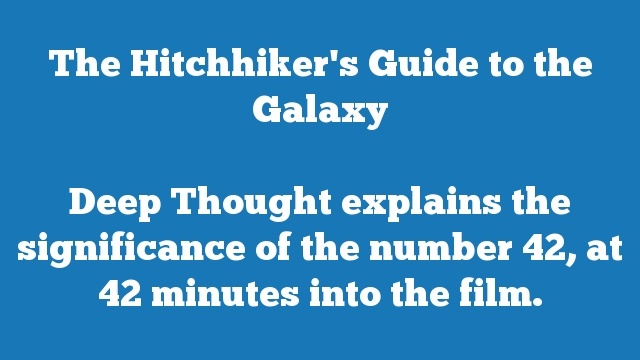 Deep Thought explains the significance of the number 42, at 42 minutes into the film. A painting of Douglas Adams and his wife Jane Belson appears on the Heart of Gold. 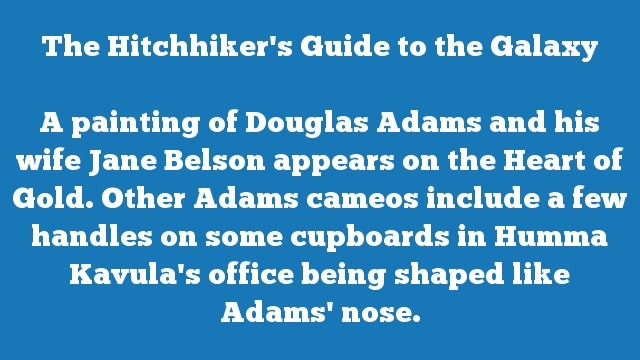 Other Adams cameos include a few handles on some cupboards in Humma Kavula’s office being shaped like Adams’ nose. 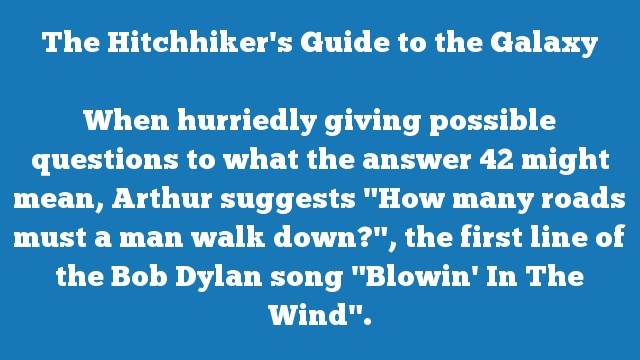 When hurriedly giving possible questions to what the answer 42 might mean, Arthur suggests “How many roads must a man walk down?”, the first line of the Bob Dylan song “Blowin’ In The Wind”. 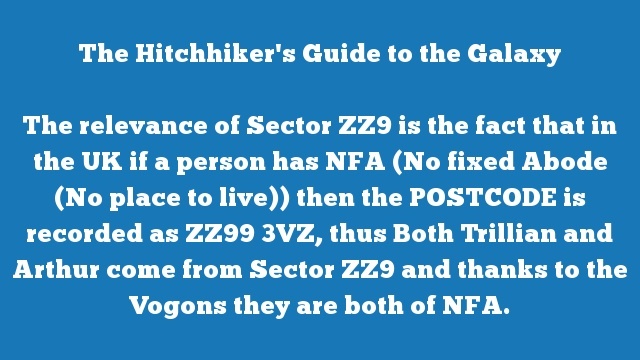 The relevance of Sector ZZ9 is the fact that in the UK if a person has NFA (No fixed Abode (No place to live)) then the POSTCODE is recorded as ZZ99 3VZ, thus Both Trillian and Arthur come from Sector ZZ9 and thanks to the Vogons they are both of NFA. 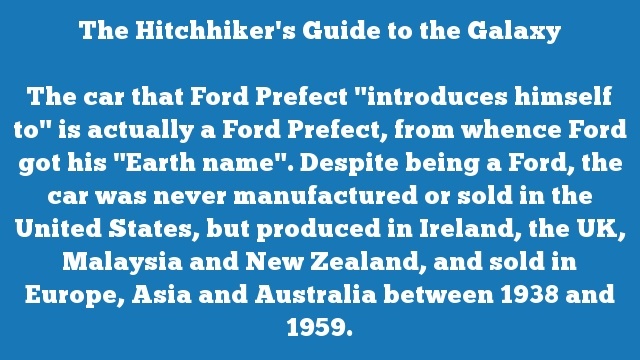 The car that Ford Prefect “introduces himself to” is actually a Ford Prefect, from whence Ford got his “Earth name”. Despite being a Ford, the car was never manufactured or sold in the United States, but produced in Ireland, the UK, Malaysia and New Zealand, and sold in Europe, Asia and Australia between 1938 and 1959. 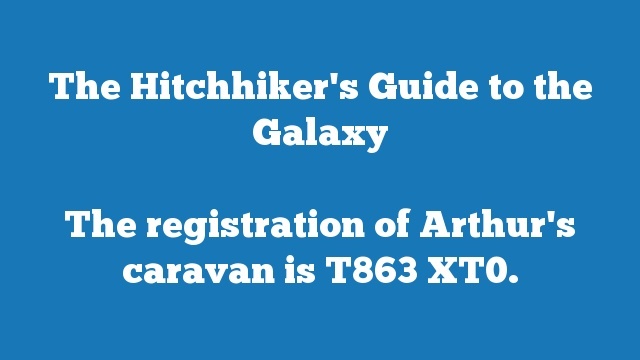 The registration of Arthur’s caravan is T863 XT0.